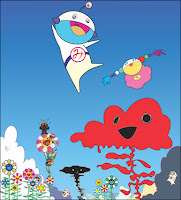 Surrealistic art in this day in age is huge it span's from fashion juggernauts such as Louis Vuitton to music sensationalist Kanye west who use Surrealistic Artist Takashi Murakami on his latest album art. Surrealistic art is in my opinion the most important form of art reason being it allows you to express yourself with no limit much like graffiti art. Artist such as Salvador Dali (pictured above) is a pioneer in this form of art with classic painting titled "Melting Clocks". Here is an painting done by Takashi Murakami..LONG LIVE SURREALISM.